Google’s Hotel Finder, a service I use almost every single time I travel, is now better suited for mobile browsing. 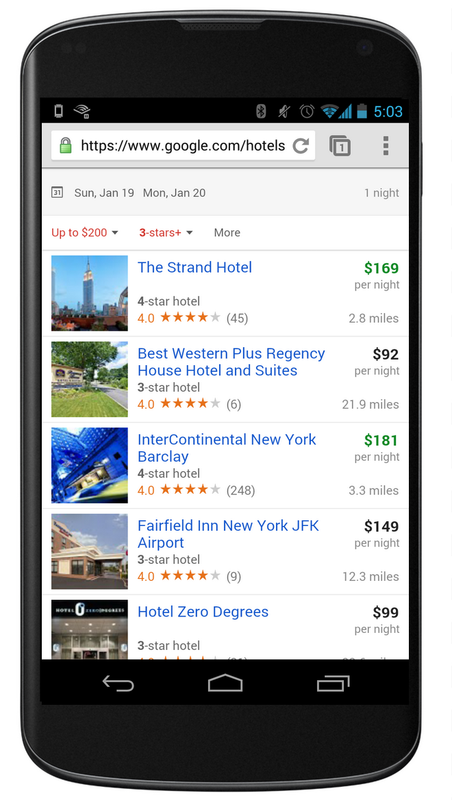 Google updated the hotel-deal-finding site with a mobile UI that makes it easy to sort by price, hotel class, user rating, and distance. They also show you photos, hotel amenities, reviews, and location on a map with a simple tap or two. Once you find a hotel to book, you can do so via partner sites like Priceline, Booking, Orbitz, etc., or quickly check out using the “Buy With Google” button. So if you are a late booker, simply want a last minute upgrade to new digs, or only have your phone handy for trip planning, feel free to jump in your browser to www.google.com/hotels. And seriously, I constantly use Hotel Finder on trips, along with Google Flights. These are by far my best travel tools and often tip them to friends and family who are booking vacation or even work travel. With Hotel Finder, you can section off areas of a city you’d like to stay in, sort it by hotel class, check quick reviews, and even see photos. With Flights, you can customize a trip and also see clearly which times and prices will work best for you. Outside of Hotel Finder, Flights is my go-to source for flight booking.